PHOTO BY KEVIN CHAN aka SOLARTEMPEST! EPIC photo! Legendary photo!! The wigs and the colours are what they should be!! The gi's were so comfortable!! DRAGONBALL 4-EVAR!!!!!!! Trunks, Son Goten and all likeness of DragonBall/Z/GT is © Akira Toriyama etc. You two are A D O R A B L E!! Aaaawwww that's so cute!!!!! Can I have them? Awesome cosplay! You two really are the dynamic duo! 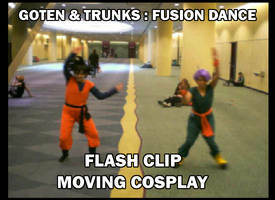 awesome cosplay you are the best Trunks & Goten I've ever seen! Oh my gosh oh my gosh oh my gosh oh my gosh GOTEN AND TRUNKS this beautiful friendship foreverrr. It's so rare to see well done DBZ cosplay and you guys nailed it!!! Great job! im not into cosplay but this is awsome! How do you get the gi's. Do you buy them, can you tell me where you buy them. Or do you make them, but how? Hi we made our gi shirts and pants from fabric we bought. The pants are just basically really wide pants with pleats at the crotch and back with an elastic waistband. The ankles are pleated and have a cuff sewn onto them to finish the look. The tops are basically squares with sewn arm holes and a deep V for the neckline. Awesome! Hey, a friend and I are gonna be cosplaying Trunks and Goten, but I'm having trouble with my wig. Do you know how Goten did their wig? wow super cute!....you make a great trucks and your friend makes great goten!....you guys look simular are you twins? omg that is so cute!!!!! I wanna do a Vegeta cosplay! could you explain me something more,please? I really adimre you,you're so talent! A TRUE cosplayer! that is awsome how you go tthe hair to look like that!! i'm gonna add this to my favs and you to my deviant watch cause how good this cosplay was. OMG!!!!!!!!!!!!!!!!!!! i dont have wordss!!!! <33 u got a fav n my fanatism!!! the best cosplay of them I never seen!!!!!!!!!!!!!!!!!!!! is it gohans real hair?!!! I love this pic! SOOOOOOO CUUUUUTE!!!!!! I love Trunks and Goten in DBZ and you guys make quite the pair. I'm blown away. Awesome! Those must be the coolest DBZ cosplayers ever! This is probably the best Dragonball cosplay I've ever seen! Is there anything in fandom you two aren't good at?? Fanart, fanfiction, cosplay.....you rock at all off it!